When you and your beloved pet are out for walks it is important that they are kept safe. 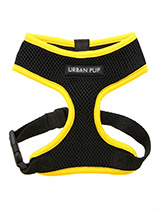 Here at Urban Pup, your pooch is kept safe with our active mesh harnesses which are comfortable as well as stylish. Our harnesses provide the ultimate comfort and safety, as they each feature a breathable mesh material for maximum air circulation that helps prevent your dog from overheating. If you and your pooch are training buddies, we're here to help. 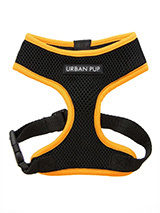 Our active mesh harnesses not only come in a range of bright colours so your pup can be seen, but they are light weight as well as strong, providing your pup with complete comfort. Each of our active mesh harnesses has a secure but adjustable quick-release clip for your dog lead, clipping onto the D-ring between the harness' shoulders. This distributes pressure evenly if your dog pulls, so your pet is comfortable at all times in our active mesh harnesses. 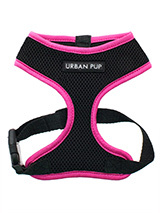 The harnesses come in black, trimmed with neon, stylish as well as practical. 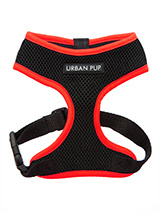 Here At Urban Pup we are passionate about making sure your pet pooch is kept warm and safe in complete style. All of our products, from our stylish leads to our waterproof jackets, are of the highest quality finish. Urban Pup takes pride in providing the widest selection of original pieces with outfits and accessories fit for all styles and all occasions. If you would like any more information on our products or if you have any questions, please do not hesitate to contact a member of our friendly team.